We've just released a new feature today that a number of our users have shown interest in - the ability to add acceptance criteria to a ticket that must first be satisfied before the ticket can be closed. 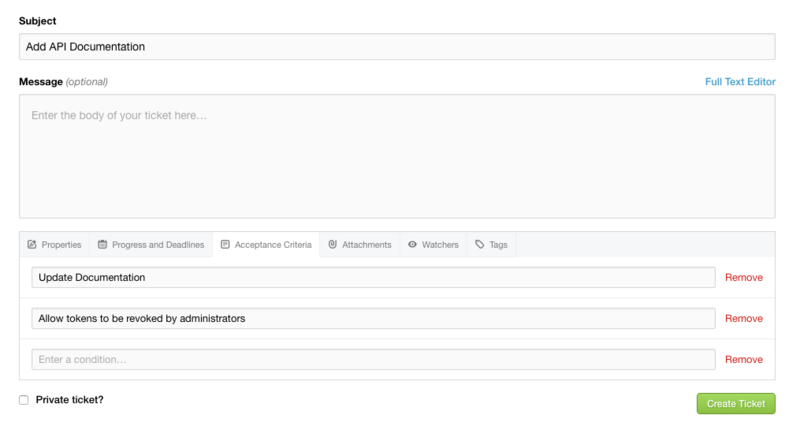 Now when you create a new ticket you'll find a new Acceptance Criteria tab at the bottom, where you can add any number of separate criteria to be satisfied. This will also be presented as an option to the right hand side, when editing an existing ticket. Any criteria added will then be shown permanently at the top of the ticket. Once all criteria have been satisfied, the appropriate criterion can be marked as complete, and the ticket closed. As always, do get in touch with us if you have any questions.